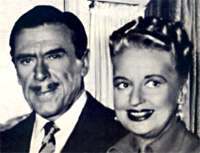 Serious banker Cosmo Topper (Leo G. Carroll) and his wife Henrietta (Lee Patrick) move into a new home. 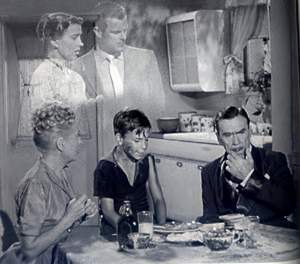 Much to Cosmo’s dismay, the house is haunted by the previous owners, George (Robert Sterling) and Marion Kirby (Anne Jeffreys). Worse, only Topper could see or hear them. The Kerbys had died in a skiing accident on their fifth wedding anniversary. 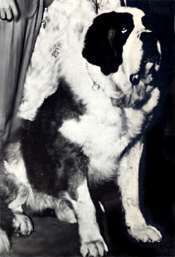 Their beloved St Bernard dog Neil (Buck) had tried to rescue them and lost his life in the attempt. Poor Neil had developed a drinking problem with a preference for brandy. The Kerby’s were fun people and they could get away with anything they wanted. Topper’s life would have been very boring without them. 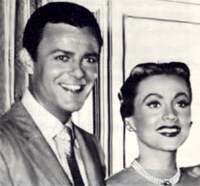 Anne Jeffreys and Robert Sterling were married in real life. TV Guide’s Topper Page, with TV Listings, Photos, Videos, Exclusive News and More.